The number of older people needing care is set to nearly treble globally by 2050, campaigners say. Currently 101 million people require care, but a report from Alzheimer's Disease International warns the figure will rise to to 277 million. 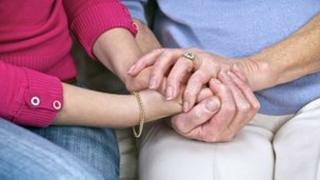 Many needing care have dementia, and the report warns there will be a "global Alzheimer's epidemic". The report's author said countries like India and China would be hard hit - and must start planning services now. Alzheimer's is the most common cause of dementia. Symptoms include loss of memory, mood changes, and problems with communicating and reasoning. More than 35 million people live with dementia across the world, according to the World Health Organization. More than half are living in low and middle income countries. The report reveals that as the world population ages, the traditional system of informal care by family, friends and the community will need much greater support. Just over one in 10 people aged 60 or over needs long-term care, according to the report. This includes daily help with things like washing, eating, dressing and using the toilet. It can put huge pressure on families. Carers often have to give up work to look after elderly relatives. Treating and caring for people with dementia currently costs the world more than £376bn per year. That includes the cost of health and social care as well as the loss of earnings. Prof Martin Prince, from King's College London's Institute of Psychiatry, the author of the report, said lower and middle income countries including India and China need to urgently start planning services to deal with the "epidemic". "The social and economic changes happening in those countries are inevitably going to mean that family carers will be less available. "Things like the decline in fertility rates mean people are going to have fewer children. "Women are also better educated so are more likely to join the paid workforce and are going to be less likely to be available to provide care." And he said an increase in migration between countries, and from rural to urban areas amongst younger people meant there would be a lot of older people "left behind". The report makes a range of recommendations including giving paid and unpaid carers "appropriate financial rewards" and monitoring the quality of care both in care homes and in the community. A spokesperson for the Alzheimer's Society in the UK said: "Dementia is the biggest health crisis facing the world today. "This report is a wake-up call to governments across the world about the immediate need to put in place more care and support. "The UK government's G8 summit on dementia this year will be a key opportunity to rally support from world leaders to tackle dementia together. We need to see political leadership to avoid a spiralling global crisis," the spokesperson added.